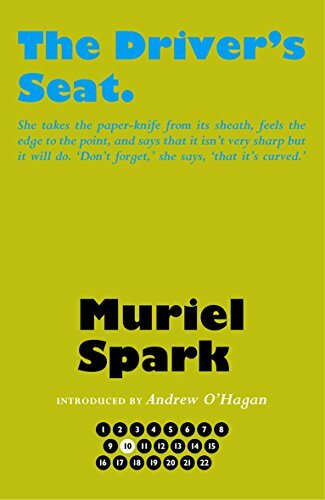 The Driver’s Seat by Muriel Spark was first published in 1970 and I borrowed this copy from the library. All of Spark’s books were reprinted last year to commemorate the 100th anniversary of her birth. This is a very quick read – as are most of her books, just a novella of 90 pages. Like many of Muriel Spark’s books this is a strange read with really no likeable characters and particularly not the main character Lise. She had been working in an accountancy firm for years and she has decided that it’s time she had a wonderful holiday abroad. The book begins with Lise in a shop trying on a dress to wear on holiday. She ends up buying a dress and summer coat both of which have very distinctive patterns and clashing psychedelic colours. She looks a fright in them but it’s obvious from the beginning that everything that Lise does is calculated to get the attention of as many people as possible. She gets into odd conversations with complete strangers, obviously determined to be noticed and remembered by everyone she meets. She’s looking for a particular man but she doesn’t know what he’ll look like although she thinks he might be on the plane. “I never trust the airlines from those countries where the pilots believe in the afterlife”. I can see the reasoning behind that! I can’t say that I really enjoyed this book as the storyline is so obvious, it’s supposed to be obvious, the reader knows what Lise is up to, well, I say that maybe it isn’t so obvious to everyone but if you’ve had a Scottish upbringing as Muriel Spark had, then you know all about predestination and that very Scottish phrase – what’s for you will not go by you (your destiny will not pass you by.) It’s part of the Scottish psyche, just ask R.L.Stevenson.